The Drive was an enormous success. The weather was kind to us, too. 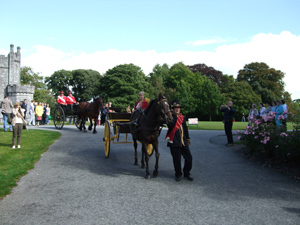 The Pony and Trap Drive from the Grounds of Kilkenny Castle was a sight to behold. Billy and Mary lead the Drive in a traditional Governess Carriage. The day finished with a beautiful meal at The Thatch, Grannagh, Kilmacow. Delighted to say this year’s drive raised €5,748, which includes Mary Corcoran’s sponsorship of €2,045, bringing the total raised up to and including 2010 to €38,307.